Howard County is a county located in the U.S. state of Texas. At the 2010 census, its population was 35,012. Its county seat is Big Spring. The county was created in 1876 and organized in 1882. It is named for Volney E. Howard, a U.S. Congressman from Texas. Howard County is included in the Big Spring, Texas Micropolitan Statistical Area. According to the U.S. Census Bureau, the county has a total area of 904 square miles (2,340 km2), of which 901 square miles (2,330 km2) are land and 3.4 square miles (8.8 km2) (0.4%) are covered by water. 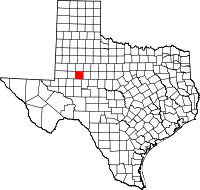 Howard County is located at the boundary between the Llano Estacado to the north and the Edwards Plateau to the south. Beals Creek, a tributary of the Colorado River, flows through the center of Big Spring and divides these two major physiographic regions. Ar the 2000 census, there were 33,627 people, 11,389 households and 7,949 families residing in the county. The population density was 37 per square mile (14/km²). There were 13,589 housing units at an average density of 15 per square mile (6/km²). The racial makeup of the county was 80.14% White, 4.13% Black or African American, 0.59% Native American, 0.59% Asian, 0.01% Pacific Islander, 12.43% from other races, and 2.10% from two or more races. 37.46% of the population were Hispanic or Latino of any race. There were 11,389 households of which 32.80% had children under the age of 18 living with them, 53.30% were married couples living together, 12.20% had a female householder with no husband present, and 30.20% were non-families. 26.80% of all households were made up of individuals and 13.20% had someone living alone who was 65 years of age or older. The average household size was 2.53 and the average family size was 3.07. 24.20% of the population were under the age of 18, 9.00% from 18 to 24, 30.90% from 25 to 44, 21.30% from 45 to 64, and 14.60% who were 65 years of age or older. The median age was 36 years. For every 100 females there were 118.00 males. For every 100 females age 18 and over, there were 122.50 males. The median household income was $30,805 and the median family income was $37,262. Males had a median income of $28,971 and females $21,390. The per capita income was $15,027. About 14.50% of families and 18.60% of the population were below the poverty line, including 24.70% of those under age 18 and 15.50% of those age 65 or over. The county is served by a daily newspaper, local radio stations KBST (AM), KBST-FM, KBTS (FM), KBYG (AM), nearby stations KBXJ (FM), KPET (AM) and KWDC (FM), and the various Midland and Odessa radio and TV stations. ^ "County Population Totals and Components of Change: 2010-2017". Retrieved April 12, 2018. Wikimedia Commons has media related to Howard County, Texas.